3. Maximize global health outcomes through patient care and public service. Attracting and retaining talented and diverse faculty, staff and students. Delivering a contemporary and innovative professional curriculum that empowers students to advance pharmacy's contribution to healthcare and to provide excellent patient care. Generating, integrating, and applying knowledge across disciplines to advance discovery, learning and engagement in pharmacy and pharmaceutical sciences. Producing world class scientists for academia and industry. Establishing new synergies: partnerships, collaborations and strategic alliances at the local, regional, national and global levels. The Vision for Purdue University College of Pharmacy is to transform the practice and science of pharmacy to lead advances in human health. The number of discovery-based initiatives with clinical, scientific and/or economic impact has increased. Our faculty, staff, students and alumni are engaged across colleges, healthcare systems, industrial partners and professional associations to address healthcare needs. Faculty, staff, students and alumni pursue and achieve positions of leadership that impact education, research, policy, and delivery of care related to human health. The education of students incorporates knowledge of cultural differences in healthcare delivery and effectiveness. We are providing access for a diverse student population that fosters a culture of inclusiveness and success. 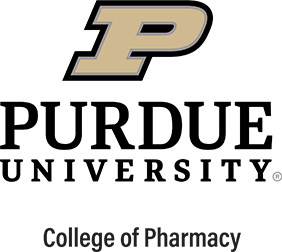 Purdue is a global model for leading enhancements in human health. Our graduates are proactively recruited by leading employers. There is an increase in the number of students entering advanced professional training and/or post-graduate education. Medication safety and practice are enhanced as a result of our collaborative efforts with other professionals to develop and manage systems. The number of new synergies (partnerships, collaborations and strategic alliances at the local, regional, national and global levels) has increased.